They place their orders at the Chic Filet counter and carry their trays and packages to an empty table the daughter has pointed out. Bowing their heads in prayer they ask the Lord to bless their food and thank Him for a day spent together. A Man sits near by and is listening. He’s pleased. “Mom, I had the weirdest dream last night.” The daughter states after taking a drink of her ice tea. “It’s really kind of scary. It was so vivid, like I was really there!” The daughter answers. “Did you expect Him to?” the mother asks. The Man chuckles, coughs, and takes a drink of His drink when the two women realize He’s listening. “So what happened?” The mother asks leaning closer over the table. “What’d He say?” The mother excitedly asks. I woke up!” she almost yells in exasperation. The two women look up at Him with questioning expressions. “And who might you be?” The mother asks a little perturbed at His boldness. “I am your defense against the enemy!” The Man responds firmly. The Man walks away when the two women begin reminiscing about some of the daughter’s pranks and laughing. Did you notice the non-nonchalant attitude of the women with the Creator of the world standing there? What would you do if the Great I Am walked over to your table? I copied and pasted (reblogged) Well worth the read even though it is a bit long. I was escorted by two angels to a seat on the left side, down front, of the Supreme Courtroom. There were many hundreds of angels and saints already seated before the Bench. I was surprised how much it looked like our Supreme courtroom in America, except it was much larger. It looked more like a giant arena with thousands of seats ascending up as far as I could see. There were five big leather “lawyer-like” chairs with wings on each side in the front row. They reminded me very much of the kind of chairs my father always sat in behind his desk at his law firm years ago. There were gold-embossed cards on them that said, “Recorder” on all five of these chairs. I must have been the first to arrive, and I was ushered into the one closest to the Bench. I sat down and sunk into this really comfortable chair and was handed a pen and a small scroll. I was curious as I looked at it, for it looked really old-fashioned. The pen was a feather quill with an old fashioned nib like a fountain pen at the bottom to write with. The “pad” was a scroll that was made out of parchment. It would open automatically as you wrote upon it when you got to the bottom of the page. It was kind of like an iPad that looked like a small Torah scroll at the same time. The angel showed me how it worked, it was extremely easy to hold and write on. When I would start to write, it would write whatever I thought of in perfect calligraphy script as fast as I thought it! The nib seemed to just fly over the parchment with ease in my hand. It would write whatever the angel put into my mind from what I saw and heard to record, and then would describe perfectly any other information the Holy Spirit deemed important in an instant as it happened. It was the easiest thing I ever written, it seemed to do all the work without my thinking or trying. I think this must be heaven’s way of court/legal stenography! Most amazing of all, I was writing in Hebrew, and I hardly know the language at all! But, somehow, I understood and thought in fluent Hebrew during this vision. I cannot offer any explanation for this at all. We all stood up exactly at the same time in unison. Then the most awesome sound of praise and worship filled the atmosphere as we all began to praise His Glorious Majesty together. I have never experienced such a sense of awe as the Fear of the LORD filled the Court! It was only then that I could just make out who was seated behind the Holy Bar. There were not nine judges, but twelve. God the Father sat in the middle with six of the Supreme Court Judges on both sides of Him. I somehow knew He was the final deciding vote in every decision. After our praises finished, the Angel Justice, who I now saw was a Lady and not a male Angel, shouted: “Be Seated! The High Court is now is session. She was standing just in front of His Throne. She had a golden gavel and struck a giant crystalline base with it . There was a great thunderclap and lightning flashed out from the gavel base and flew across the room in all directions. The other Judges to the Father’s right hand were Enoch, Father Abraham, Moses the Lawgiver, David the King, Elijah the Prophet, and Daniel. On the Father’s left hand were John the Baptist, Peter, James, John, Andrew, and Paul the Apostle. I do not know whether these were the permanent Judges of the Supreme Court of Heaven or not, but these were the ones seated for this case. They all were also dressed in these black iridescent judge robes There were stunning crowns of glory on each of their heads, and they were holding gold scepters in their right hands. The Father in the middle on the Throne of Judgment held the biggest scepter and had many crowns suspended over His head that shot lightnings out of them in every direction. I could not look upon them or His face because it was so bright it was like looking into the noonday sun. I was given one glimpse at Him when He first came into the Courtroom. 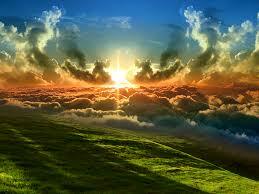 There was a rainbow that would appear that encircled Him above and below that I saw a few times during this vision. I could not endure looking at Him for more than a split second before I had to avert my eyes for the white blazing brightness was too intense. All the judges behind the Great Bar were emanating great light that was also nearly blinding. That is the closest I can describe them now. “Representing the agenda of the fallen lucifer, now called satan, is himself, the Accuser, liar and deceiver, – Ha satan.” At this, the handsome prince with the evil smirk stood up. No one moved. There was silence in the courtroom for about a minute. Then, Lady Justice spoke again, “You may sit down now.” Finally, he did so, with another sneering grunt. I marveled that he seemed human and actually very attractive to look at, although there was no heavenly light in him or around him. “Yeshua continued, “As you can see, my faithful Bridal remnant has kept the faith, enduring the evil, and continue to overcome. The blood of the martyrs has proven their faithfulness. Look at China. Look at the Middle East, look at Africa, look at Indonesia, look at South America, look at the islands of the sea, and look at My persecuted Bride in all nations. Even America has held, though all of hell has been thrown against her. The facts speak for themselves. I have the authority to request for another extension of time. The Defense petitions the Court for another extension of time in the Grace that I purchased by My blood on the cross. Also, I petition the Court to look into the scrolls of the hidden counsels written before the foundations of the earth regarding the Mysteries of the Harvest of the end of days. These, satan has no knowledge of – as they were never shown to him. It is written there, as well as in the hidden revelation of scripture, that the Tribulation beginning the Kingdom Age must begin only after ALL of My Bride that are ordained to Eternal Life are saved and come to the knowledge of the truth. This information can also be found in the scroll given by My hands to the Court for eternal record. The evidence written in this scroll fully confirms and documents our Holy and Righteous claim.” Though millions shall come to me and be saved in the Tribulation to come, My Holy Bride must all be prepared now! Then there came a time of silence. Nobody moved. The Judges on the bench were studying the scroll. Somehow it had multiplied into 13 scrolls. All of the Judges, (including the Father), read through the scroll. I got to get one glance at the writing. It was written in red! It was written in the blood of Yeshua! I was told that by the chronicling angel that was helping me to write .Amazingly, as I wrote about this, the ink coming out of my pen became blood red as well for the duration of the description of it. Then, it turned back to black ink again. Then the Angel, Lady Justice, came forward and was blindfolded. She raised a large, old fashioned scale in her hands above her head. Into one of the bowls a presiding angel poured a black sand-like powder from a brass urn. This tipped the scale to all the way at the bottom as far as it could descend. This represented the accumulated sin and rebellion of all of mankind, as well as the failures of the church in this generation. Into the other bowl, a presiding angel dressed in a golden robe poured a white sand-like powder from a porcelain white urn that represented the prayers and intercession and obedience of the overcoming church in generations past as well as the Bridal company of our generation. (This is what allows for evil to be restrained.) I was really alarmed, because it looked so small at first compared to the amount of black powder in the other bowl. But, the angel kept pouring, and suddenly the Holy justice scale began to balance out. Then it was even. As we all watched, the scale suddenly shifted. The white bowl went down and the black bowl came up! Then there were mighty shouts of Praise and Victory in the Courtroom! Don’t forget to follow True Conservative Pundit on Facebook and Twitter. Please help spread the word about us, share our articles on your favorite social networks. The day is over cast, no sun has shown through as the young man speeds down the road. Traffic has been light on this Sunday morning. He’s not worried about being late for church. He grew up in church but his buddies has convinced him, “You don’t need some fantasy God anymore.” He’s rushing to the lake to meet them for some fishing. Entering a small country town he slows for a child on a bicycle and then romps on the gas pedal as soon as he passes the little boy. He quickly glances to his right as he speeds through the intersection and before knowing what has hit him his car careen’s, flips, and rolls several times slamming into a telephone pole. His body is lifted up, out, and through the heavy glass of the windshield as it shatters, leaving him cut from head to foot. Lying in a pool of blood he’s barely conscious of a Stranger coming to his aid. The Stranger kneels beside him and tends gently to some of his wounds. The young man glides in and out of consciousness and isn’t aware of the scream of the ambulance siren. “What Man?” the boy asks. The young man lies quietly for a long time trying to remember and suddenly a picture of a Man kneeling beside him, tending his wounds and praying over him plays out in his mind. He searches his mind trying hard to remember more when the words, “A drunk driver hit you. I’m here to save you. I am the I Am and you will be fine. Go back to church and sin no more,” fill his mind. It is such joy to walk past a Sunday school room filled with children and hear them singing, “Jesus loves me this I know…” Their little hearts are full and we can be proud of God-fearing parents that introduce their little ones to God’s great love. As these same children mature and enter public schools those same children are influenced by peers, teachers, and administrators into non-belief. Prayer, Bibles, and anything relating to Christian beliefs are now banned from schools. Children are being indoctrinated into non-Christian values. The worlds values! It is sad and discouraging to watch as our society turns back to the evil ways of the world leaving those generations behind us to flounder with no Godly boundaries, morals, or Godly hope. As adults it is our responsibility, not only to our children, but to God, to teach our children about Jesus Christ and His saving grace. Without it we will see the future generations decline into a Hellenistic world. The sound of horse’s hooves echo across the sky and thunder rolls vibrating all that is in its path. The blast of a trumpet resounds drowning out the clap of thunder as streaks of lightning streak down from the heavens. Gasps are heard throughout the cities. People stop and look up. “What’s happening?” is whispered as others scream in terror. “It is He!” someone shouts and tries to hide behind the corner of a building. Others have fallen to their knees and “Praise be to God Almighty” is heard from reverent voices. “I am coming” echoes off the mountains, the buildings, the clouds above. Suddenly people are dropping like flies, graves are flying open, and others are being lifted bodily toward the sky. Thousands, millions, are gathered like swarms of locusts marching toward their heavenly home. Others lie dead, their flesh rotting like stale meat. 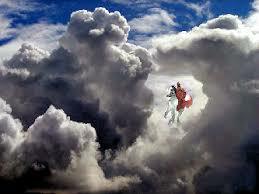 “I am coming,” the Man, the Great I Am shouts as His horse tramples the clouds and the sun turns to darkness. Screams, cursing, tormented souls fall silent and an eerie silence fills the land. I don’t know about anyone else but I definitely do not want to be left behind when the Lord Jesus calls His church home. Scriptures are filled with warnings about unbelief, as well as encouragement to seek Christ for His gift of salvation. We have only two choices as to where we will spend eternity. The Lord will not force us to choose heaven with Him nor does He send anyone to hell! That choice is strictly of our own volition. We choose before that last breath as to whether we will join those who are dead in Christ when they rise from their graves at the trumpets sound or whether we will be left behind to suffer the great tribulation. Choose wisely. Eternity is a very long time. 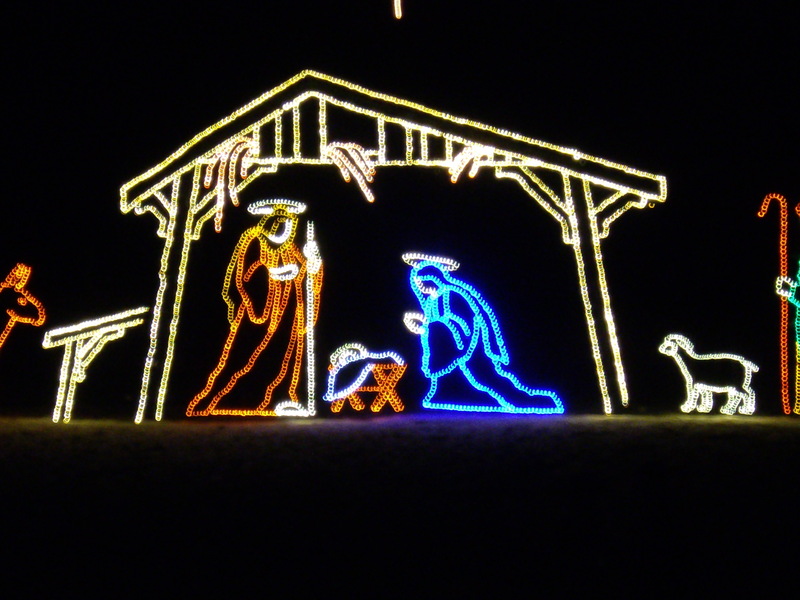 Christmas, everyone knows of it, but how many know about it? Christmas to many is all about eating, drinking, partying, time off from work, indoor and outdoor light displays, and of course giving gifts. While spending time with family and friends, eating a good meal, (probably eating to much!) and all those cool lights and decorations are just fine, Christmas isn’t about partying, eating, and all the decorations. Christmas is a seriously over-commercialized event in which the true meaning of Christmas is easily lost. This writer will say that this is done by design; it has a purpose and an end goal. 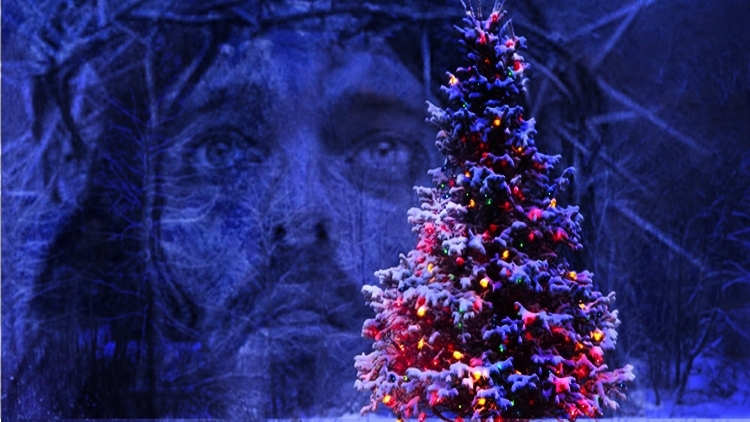 The goal of Christmas in this day and age is to divert the focus of everyone from Christ – to self. Christmas is by design all about fun, let’s eat, let’s party, let’s buy this and that, let’s outdo everyone else with our light displays etc. Anything to get people to move away from celebrating the birth of Jesus Christ, which is what Christmas is supposed to be about. The commercialization of Christmas is nothing short of disgusting, Christmas items are going up in stores even before Thanksgiving! People tend to spend a lot of money at Christmas, $100s per person is not uncommon. Racking up HUGE credit card bills is also very common. Retailers stand to make a fortune at Christmas time, and they want your focus on spending your money in their store – not on worshiping Jesus Christ. While as I said gifts etc. are fine, the real gift that matters is the gift of life, brought about by the birth of Jesus Christ. It is in a way strange to think that even more important then the birth of Christ – was His death. The death of Jesus Christ on the cross is what gave each one of us our very lives. To sin is to die, Christ came and paid that price for us that we may have life and have it abundantly. Salvation is a gift, it cannot be earned by anyone ever, and this gift to us was paid for in Christ’s own blood. Jesus was and is the best gift ever given to humanity. Jesus did not have to come here as a lowly human, God was in NO way obligated to come here in the flesh and save us – from our very own crimes against God (sin is basically committing a crime against God). But this is exactly what Christ Jesus, or Messiah Jesus did. So go ahead, celebrate Christmas, and celebrate the One who was born to save you and to save me. Don’t let anyone rain on your parade for celebrating Christmas, it’s not as some wrongfully allude to, a “pagan” holiday. I will not here cover that, instead, I will direct you to an article by a friend of mine, CJ, over at, I am not Ashamed of the Gospel of Jesus Christ. There is nothing wrong with celebrating Christmas and having some fun. Unfortunately, that is all Christmas is to many people. Take some time this Christmas and celebrate the birth of the Savior. Take a few moments to be alone with the Lord and pray and give thanks to the One who saved you. Jesus IS the reason, today, tomorrow, and forever. AMEN. Who cares about the date!? Was it in February? Did it happen in June, or September? Maybe it happened in December, nobody except those that were there know the exact date and time. I was born in February and only the Doctor and my mother and father know the exact time and date and yet if my birthday falls on a Wednesday this year and it is inconvenient to have a birthday party during the week, we decide to have it on the Saturday before, what difference does it make? It really doesn’t matter if the party is exactly on the day and time that I was born, now does it? How sad, to hear such lame excuses for not celebrating the birth of our Lord and Savior. How sad that so many miss the entire point of Christ’s birth and what/Who we are celebrating! Does a date really matter? Does celebrating my birthday on Saturday, rather than Wednesday, really matter? Or are we celebrating the birth of a child, someone who is loved, cherished, and can grow to be a great man or woman of God. Are we celebrating the birth of the King of kings and the Lord of lords or are we turning away because “He wasn’t even born December 25th?” It makes me wonder what these people are celebrating. Christmas is about Jesus Christ! Not a Christmas tree, not Jingle Bells, and Santa Clause. It is no more about those things than Easter is about rabbits and eggs! My prayer is that as we celebrate our Savior’s birth that we do it in humility and honor of our Lord and Savior, and that those who focus on all that is not about Him this Christmas will find the true meaning of this time of celebration. Without Jesus Christ in the manger there is no such thing as Christmas! It’s just an empty, dirty, and stinky feed troff in a smelly old barn. Merry Christmas and may Christ bless you even more abundantly with His love, peace, and Joy in 2019.